As customers begin spending more time in their yards to enjoy warmer weather, a fire ant problem can put them on the fast track to anxiety and worry. 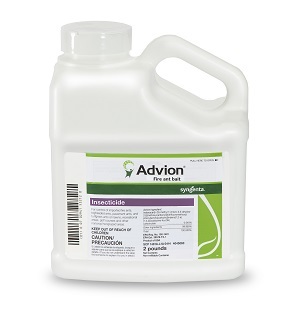 Ease their concerns with the SecureChoice℠ Fire Ant Assurance Program, which can provide at least 90 percent control of active fire ant mounds with the proven performance of Advion® fire ant bait. With only one application, Advion fire ant bait can control foraging worker ants within 12 to 48 hours and provide total colony control, including the queen, within 72 hours. Year-long colony control can be achieved after two applications. Performance assessments are based upon results or analysis of public information, field observations and/or internal Syngenta evaluations. Trials reflect treatment rates and mixing partners commonly recommended in the marketplace. Broadcast applications are best for ensuring season-long control of fire ants, as they place the bait where fire ants are active and will control mounds that may be small or invisible at the time of treatment. To qualify for the program, make at least two broadcast applications of Advion fire ant bait approximately four to six months apart (once in the spring and again in the late summer to early fall) at 1.5 pounds per acre per application. Applications of Advion fire ant bait must be applied according to the treatment protocol to qualify for the program. Mound-only treatments can be effective, but are not covered under this assurance program. Let your customers enjoy their yards worry-free with the SecureChoice Fire Ant Assurance Program. For more information and complete terms and conditions, please visit www.SyngentaPMP.com/FireAnt. ©2018 Syngenta. Important: Always read and follow label instructions. Some products may not be registered for sale or use in all states or counties and/or may have state-specific use requirements. Please check with your local extension service to ensure registration and proper use. Advion®, For Life Uninterrupted™, PestPartners℠, SecureChoice℠ and the Syngenta logo are trademarks or service marks of a Syngenta Group Company. All other trademarks are property of their respective owners. Syngenta Customer Center: 1-866-SYNGENT(A) (796-4368).